The seasons seem to come and go so fast. Maybe it is because there are so many specific things to do in the garden each month. I don’t know, but before you know it the correct season for pruning or transplanting or dividing or whatever, seems to have come and gone. The same applies to Open Gardens. I always think that I will have so many things in place for Open Gardens ‘next year’, and what happens? I spend the month of October rushing around like a scalded cat trying to get things finished! Well, done it again! 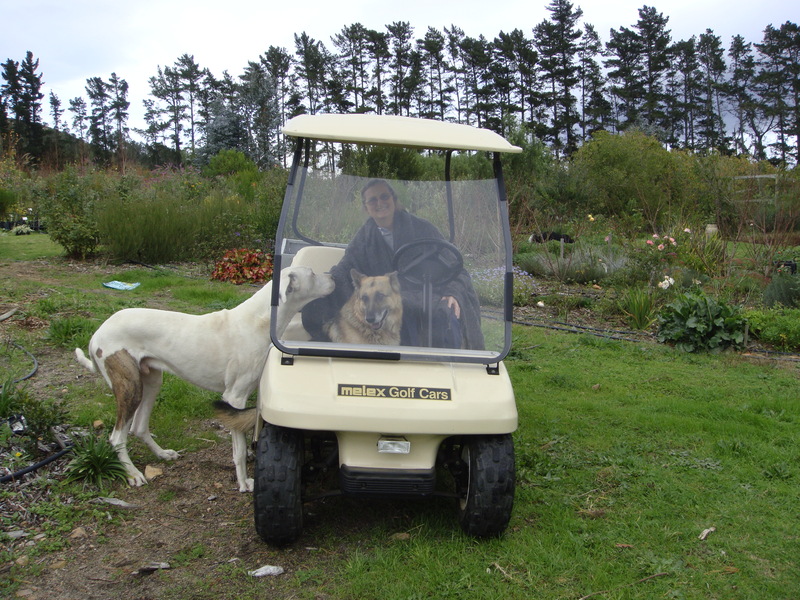 Winter in the garden with Wolfie in his favorite position in the golf car. I have tried to make things a little bit more appealing for a greater number of gardeners this year. If you have a friend or member of the family who would enjoy the garden but is not that mobile, please remember we have a mobility scooter as well as a golf car. Both are free. I will take visitors around the garden but I can only take one person at a time as the golf car has a ‘boot/cargo box’ and not back seats. I have worked on an activity booklet for the children so that their parents may enjoy their time in the garden more. It will most probibly cost about R8.00. I haven’t printed it yet so don’t have a final price. For the Dads, husbands or boyfriends, who really have a limited interest in gardening, there will be cold draught beer and sandwiches on sale, which they can relax and enjoy. Arnelia Nursery, an excellent producer of Proteas, Leucodendrons and Leucospermums, has supplied me with a lovely selection of their plants which will be on display and for sale. There are some lovely new pincushion hybrids. As they were unloading the plants, a malachite sunbird landed on one of the pincushions – obviously thought this was ‘meals on wheels’! Anyway the flowers got his vote of approval. 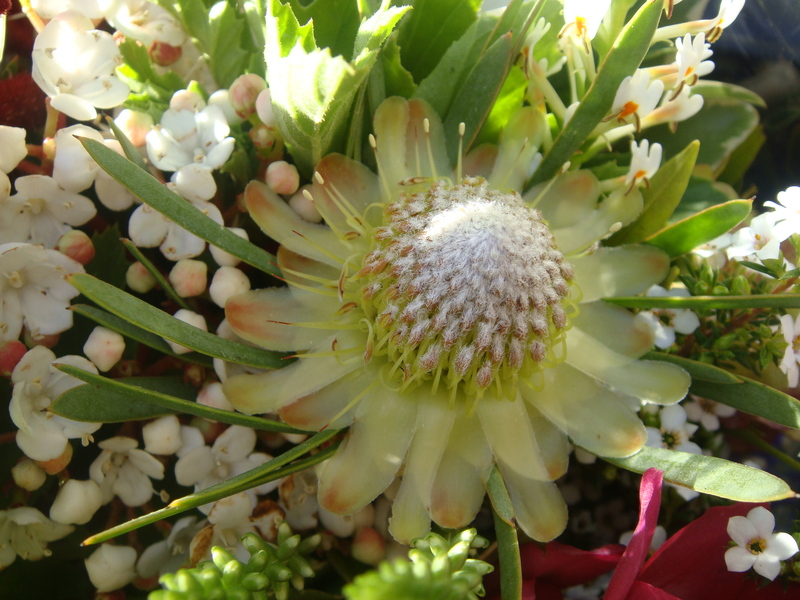 There are a few plants of my favorite miniature protea, Protea scolymacephala. Arnelia has only recently started propagating it and offering it for sale, so I was thrilled that there were some left for us. Also remember that the garden is home to a large number of birds, so these can also be enjoyed as you wander around the garden. Hope to see you on the farm.